Should I Use an Object to Clean My Ears? Ear wax (or cerumen) is a natural substance produced in the ears of many mammals, including humans. Despite popular beliefs, it helps keep our ears clean by filtering out dust, debris, and other substances like shampoo. It also protects the ear canal from infection. The ear canal is essentially a cul de sac of skin that, unlike skin everywhere else, doesn’t remove dead cells through physical erosion. Creating ear wax solves this problem. Ear wax plays an important role in the ear’s function and often doesn’t need to be removed. Our ears are self-cleaning, and if they are functioning as they should, they require no extra upkeep. In some patients, the self-cleaning mechanism gets disrupted, and ear wax becomes trapped. This can happen for a number of reasons, including the anatomy of the ear, as some people have a sharp bend in the ear canal. It can also be due to introducing foreign bodies like cotton buds or Q-tips, which can actually disrupt the ear’s self-cleaning cycle and cause the ear wax to become impacted deep in the ear canal. Because the ear keeps producing wax, the blockage slowly gets bigger, sometimes staying in the ear for years. Impacted wax can have a number of side effects including pain, irritation, and sometimes infection. Impacted ear wax can affect the movement of the eardrum or obstruct the ear canal, making it difficult for sound to pass through. In some cases, it has been associated with tinnitus (ringing in the ear). 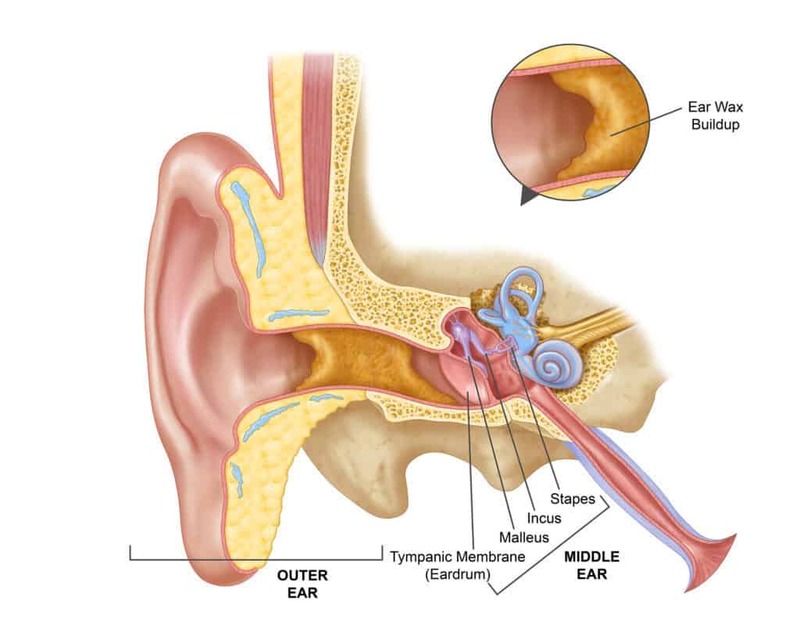 This type of hearing loss is typically treated once the wax is removed. A few drops of water or natural oil (olive oil or almond oil) can soften the wax and help it to naturally migrate out of the ear. Other treatments, such as Carbamide Peroxide, can help to soften and loosen wax. If there’s no improvement, the patient should consult a doctor, who may arrange for the ear to be syringed with water. They may also refer the patient to an ear specialist to have the wax suctioned out under a microscope. Nothing should ever be inserted into the ear to clean it. At best, the wax will be pushed deeper into the ear, making it more difficult to remove. At worst, the object can puncture the eardrum, resulting in a significant amount of pain, hearing loss, and specialist appointments. Most hospitals will see about 150 cases of eardrum perforations every year because of this. These perforations sometimes heal themselves, but often become permanent, causing pain, hearing loss, and requiring surgery to repair. There’s no evidence that ear candling is effective at removing or softening ear wax. In fact, it’s more likely to block the ear with candle wax, cause burns, or puncture the eardrum instead. A number of national public health bodies have warned about the ineffectiveness of ear candling and its potentially harmful effects.